There are big changes coming to and from AMD these last couple months. 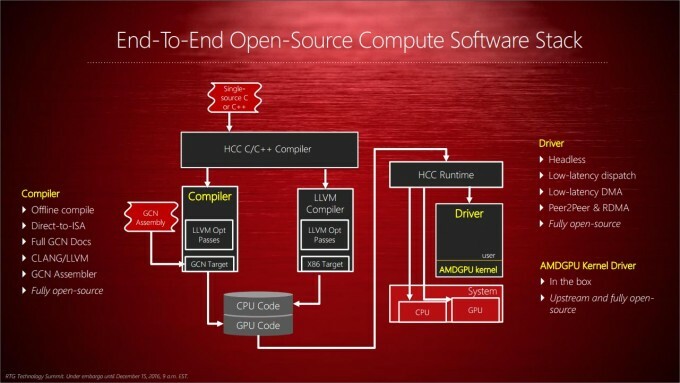 The release of the Fury GPUs introducing HBM for the first time in the consumer market, the corporate reshuffle and creation of the Radeon Technologies Group, and now we have AMD going open source on a number of projects. GPUOpen is to be a new library and code base for what is to become an open source alternative to NVIDIA’s GameWorks. We’re not talking free to look at for developers to use as examples, we mean, published under an MIT license with full access to code samples and the libraries themselves; all soon to be released on GitHub. Under the MIT license, companies and individuals are free to modify and make use of the code without any license restrictions, be it for private or commercial use. AMD’s TressFX, GeometryFX, AOFX and ShadowFX – that’s hair, physics, ambient occlusion and shadows respectively, will all be released under the new GPUOpen initiative. This gives developers a more neutral platform of effects to support a wider range of graphics technologies on competing hardware. Part of this initiative is to take the sting out of future game releases that may initially have come with NVIDIA’s GameWorks only. While a developer may support both GameWorks and the respective AMD based technologies, this double effort is seldom worth it. By providing an open alternative, one which developers have full control over, will allow them to fine-tune the graphics to meet performance criteria on all hardware, be it AMD, NVIDIA, or even Intel. 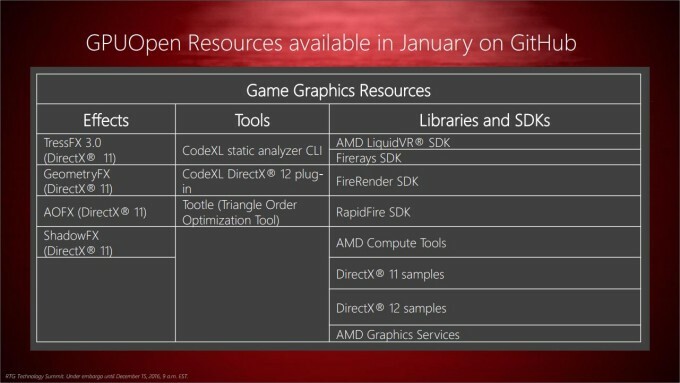 Graphics libraries with GPUOpen are only part of a bigger plan that AMD has instigated. Mention AMD and Linux in the same sentence, and there is often a groan of discontent. Not only will AMD be upping it’s game when it comes to Linux support, but it will be going further, by taking on NVIDIA’s very entrenched CUDA. 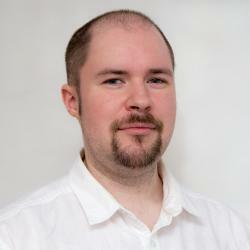 What it calls the ‘Boltzmann Initiative’, AMD will introduce new headless Linux drivers (no display required) for computation purposes, Heterogeneous Compute Compiler – a C++ compiler for GPUs, and HIP – which will convert CUDA to portable C++. This is on top of AMD’s HSA, which is a method of splitting workloads across GPU and CPU. Linux drivers will soon be more modular, with efforts to build a new base that will be used for both open and closed source varieties. Professionals and gamers will still require the closed-source drivers, but there will still be improved functionality in the open drivers, including OpenGL and later on, Vulcan. The Linux support, CUDA compiler, and even the open source effects libraries are a real signal that AMD plans to take NVIDIA on in the High Performance Computation (HPC) market, and start clawing back its lost market share over the years. We won’t see any of the source code until early next year (which isn’t too far away), but it will be a lot longer still before we see the fruits of this labor in the games we play, and in the HPC market.